Family dive vacations – you may have heard the saying, “families that dive together, stay together”. Diving is such an incredible activity but sharing it with the ones you love makes it that much better. It creates memorable live changing experiences that familes can do together. Create purposeful family vacation memories. Diving challenges kids in the best ways mentally, physically, and psychologically. Kids can begin in the pool as Bubble makers at the age of 8 becoming familiar with theory, equipment, and skills it takes to be a diver. The next level of certification is Junior Open Water which allows those 10 and above to become a fully certified diver completing the same course as an adult but with depth and guidance limitations. Typically kids perform better than their adult counterparts. Kids are fearless so they do not over think things and they just go for it. Additionally kids will mimic your every move underwater so their ability to complete skills and buoyancy and spot on. So get your kids in the ocean and make memories that they will never forget. The skills and knowledge they learn as divers will be such an advantage to them in the future opening up an ENTIRELY new world for them to explore. Here in Gili Air instructor duo from California, Scuba Sal and Mermaid Meg just certified 6 new Junior Open Water Divers and 1 Bubblemaker. The pair is new to the Two Fish Team but with lots of teaching and mentoring experience. Mermaid Meg was formerly an Elementary School Teacher that now has a slightly different classroom. Scuba Sal previously an Executive Chef enjoyed teaching young chefs about discipline, integrity, technique, and safety; skills that would be invaluable for their careers as chefs. The two have taken their previous career skills sets and combined it with their passion for diving. They have lots of diving experience around South East Asia specifically Vietnam, Thailand, Malaysia, and Indonesia. If asked where their favorite place to dive is their response will be, ” We haven’t found it yet.” Come diving in Gili Air and see how this underwater world change their lives forever. 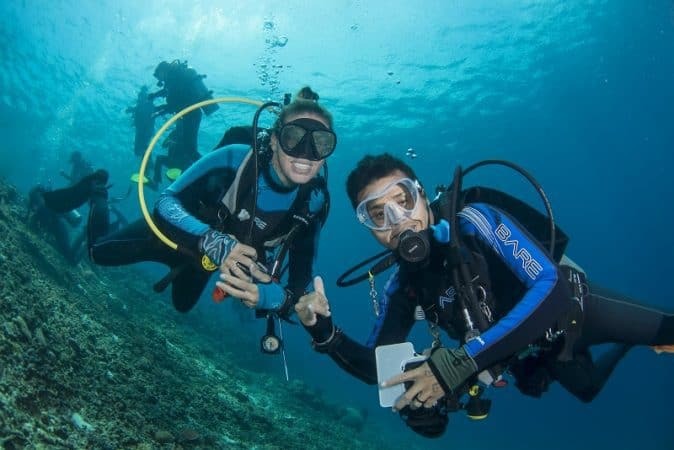 Dive in and let’s create memorable family dive vacations with Two Fish Divers !